If your child’s a high school senior we probably don’t have to tell you what an exciting but confusing time this can be. There are difficult decisions to be made, confusing applications to be completed and critical tests to be taken. There’s so much information that must be taken in and considered it could make both you and your child’s heads spin. If you’re typical, you want your child to attend the best and most prestigious school possible. However, given the price of a college education today – especially at top-level schools – this could mean years and years or debt for your child. It’s important that you don’t get all excited and end up making a choice that costs your child dearly. If you’re not aware of this, students are now graduating with an average of $33,000 in student debts, which can put a strain on a person’s life for many years to come. If you don’t want this to happen to your kid the best way to handle things is to approach choosing a college as a business decision. Given this, here are at eight things you need to know or do. Determine the amount of money you could contribute to your child’s education and then be honest about this. He or she can then decide in advance how much they’re willing to borrow to get a degree. You might have them check out the starting salaries she or he could expect to earn after graduation and then compare this to the student loan payments they would probably be required to make monthly. 4-year schools. The Department of Education did a study that found the prestige of a school made only a 2% to 3% difference in the earnings of men and 4% to 6% among women. Compare this with the difference in cost between, say, your state university and an Ivy League school. When you take this into consideration you might decide that a less expensive school that has a good reputation and offers a quality education would be a much better option. If you’ve ever bought a car you know there’s the sticker price and the real cost. The same is true for colleges and universities. The tuition price that you see listed for a school is hardly ever what it actually costs to attend it. In fact, most students at most schools pay a lot less than the “sticker price.” So when you’re checking out a school, don’t look just at the tuition price but also at its average package of financial assistance. You will then have a clearer idea of what it will actually cost your child to attend it. In some cases a school that looks awfully expensive might cost less than a school that appears to be cheap. We know you want to do everything you can for your child so you’re going to want to help with their college education as much as possible. The issue is that you may not be financially able to do this. If you don’t have the cash available to help out with your kid’s education there are loans available such as the federal PLUS loan for parents or a bank loan. However, it’s not a good idea to take out one of these loans. If you don’t have the cash to help your child it might be because you can’t afford to help. If you have to have a loan to finance your child’s schooling this could wreck your budget or even screw up your retirement. Your house could even be at risk. In 2013-2014 the cost of room and board at a public university averaged $9498 a year and for a private non-profit 4-year school the average was $10,823. Multiply this by four years of school and you’d be looking at around $38,000, which is a lot of money. If you live close to a good college or university you need to seriously consider having your child go there and live at home. If your child really wants to go away to school a good compromise might be for her or him to go to a local community college or university for two years and then go away for the last two. 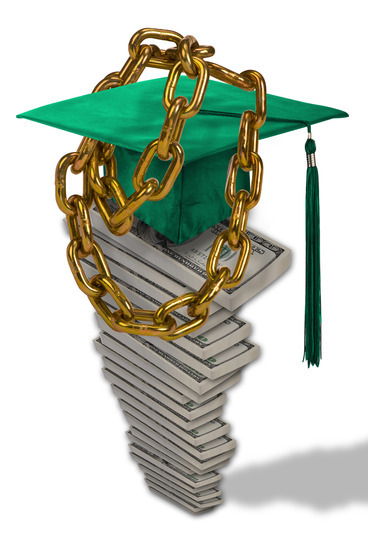 As you have read students now graduate from college owing an average of $33,000. Of course, depending on your child’s school it could be much more than this. Studies have shown that a significant amount of debt is keeping many young people from taking critical steps in life such as attending graduate school, getting married, purchasing a home or even having kids. What this means is that it’s best to keep debt at the minimum by selecting a cheaper college and stressing to your child the importance of living frugally and finding part-time work if possible. Scholarships and grants can make a considerable differenceOne of the most prevalent myths is that only top students get scholarships. Your child should be applying for scholarships even if he or she isn’t in the top 5% of their class. These can be a great source of extra money for your child’s schooling. Be sure to check out sites such as Fastweb.com and search through their databases. Your employer, union or fraternal organization might even have scholarships for the children of their members or employees. There is actually a scholarship for golf caddies where we live. You may have spent the last 17 or 18 years doing everything for your kid. In this case it’s time to begin teaching them some life skills. They’ll have a hard time adjusting to life on their own unless you teach them to do laundry, cook, change a flat tire, take a bus, grocery shop or bank for themselves. You also should have the “money talk.” This is where you discuss budgets and frugal living. You need to teach them about credit and debit cards, good money management, debt and why it’s important to have good credit. You might do what some parents have done and give your child a monthly allowance to cover the necessities so they can learn good money management. Almost everyone makes a few financial blunders before learning how to handle money responsibly. It’s much better that your child does this with an allowance than with their student loans that could amount to thousands of dollars.